Here are some ideas to achieve a stylish and modern atmosphere. If you have to create a workspace, which can be inside a house or outside, you may want to turn it into a cozy atmosphere and personality. Instead of opting for classic office furniture, we propose to use different and attractive pieces of furniture. As an alternative worktable is covered with mirrored cabinet. This piece is ideal to give light to a room. A desk with a lot of storage space, allow you to keep the room tidy and visually clean. 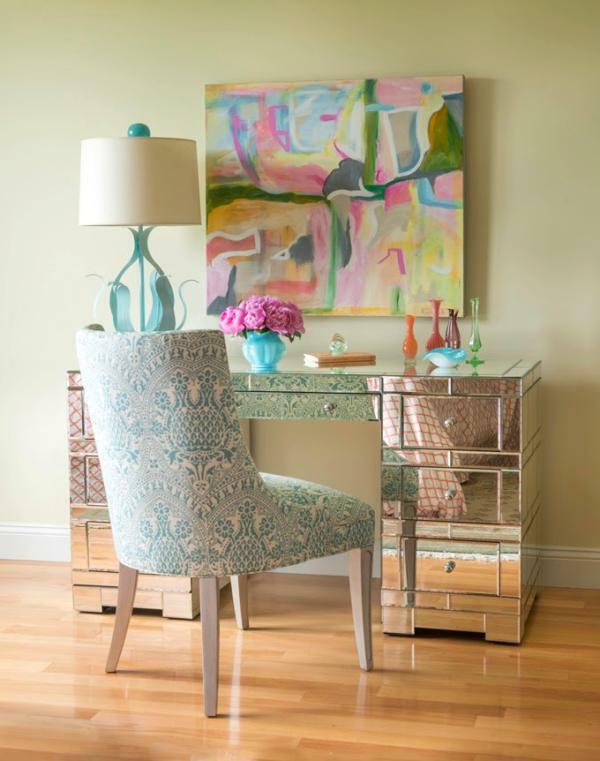 Furniture coated with mirrors adds an elegant decor wink. A great way to combine a cabinet with other furniture mirrors, is used to provide soft textures. A chair upholstered with soft textures complete a sophisticated set of office. Add decorative accessories with visual strength, like a picture with colors. will have a modern and personality work area!